Central to the philosophical constructs of most scientists is the belief that there is no supernatural—that the only explanation allowed for any phenomenon is a physical one. This idea is known as philosophical naturalism and is one of the major driving forces for the strong antagonism being exhibited today by a large number of scientists with regard to religion. Close to 95% of the members of the prestigious U.S. National Academy of Sciences are admitted atheists. Acceptance of any supernatural explanation for any phenomenon is anathema to this group. Eben Alexander, by his own admission, held to this view of explanation before he underwent the experiences related in Proof of Heaven. Even though he had some religious background, he had little church involvement and no meaningful religious commitment. He could function comfortably with philosophical naturalism. Dr. Alexander’s professional credentials are impeccable. Trained at the University of North Carolina Chapel Hill and nearby Duke University (medical school), with further training at Massachusetts General Hospital and Harvard (as well as overseas experience in England), his career was one of high-quality research and practice as a neurosurgeon. Because of this background, he was well acquainted with the prevailing ideas of neuroscience. Central to this school of thinking was the assumption that the brain was simply a very complex combination of chemical processes, and that thought basically boiled down to the interactions of neurochemicals at synapses that triggered electrical impulses. Nothing non-corporeal was considered as an explanation for mental processes. The near-death occurrence that Dr. Alexander went through profoundly changed his attitude. Confronted with this experience, he came to reject the materialistic construct he had been taught all his professional life and embraced a much more holistic view of the world around him. It would be very interesting and informative to hear how this new way of looking at phenomena affects his interactions and relationships with his professional colleagues. The medical documentation of Dr. Alexander’s case is first rate. Clinical details abound as the medical team searched for an accurate diagnosis and then struggled with an appropriate and effective treatment plan. One of the values of this information is to show how unusual his experience was during the illness. Dr. Alexander himself examines a number of near-death experiences and contrasts them with his own situation to show the uniqueness (from a medical standpoint) of what happened to him. Another useful appendix covers the neuroscientific hypotheses Dr. Alexander considered as he tried to make sense of what had happened. He considers nine different explanations (many based on evolutionary assumptions), but offers reasons to reject each one. He has obviously thought through the issues involved, while he rejects the explanations that science would bring forth. From a theological standpoint, what Dr. Alexander describes is not wholly consistent with traditional Christian teaching. Aside from the book of Revelation (which basically describes events still to come at some time in the future), there is little in the Bible dealing with the afterlife. The apostle Paul mentions in II Corinthians 12:2 a man who was caught up in the “third heaven,” but says only that he heard “inexpressible things,” not furnishing much of a picture of this experience. There are some doctrinal issues that could be debated, but Alexander wisely does not choose to pursue this path. The reading list at the end of the book is extensive. Most of the references are not to professional, peer-reviewed scientific articles since there are very few reported cases in the medical literature. While some of the books in the list are from lesser-known (and potentially biased) sources, highly reputable companies published the majority of the books cited in the reading list. Anyone interested in exploring the near-death experience phenomenon would do well to become familiar with the sources provided in this list. 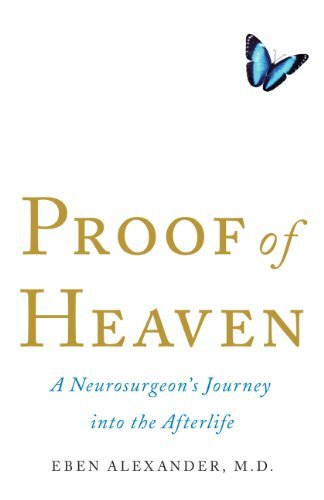 Regardless of one’s position on near-death experiences, Proof of Heaven is a thought-provoking book clearly challenging the prevailing materialistic paradigm about the nature of the world.